Michael Rosenbaum to star in his own show on Syfy!! Syfy is making a push into live-action comedy with "Saved by Zeroes," a single-camera half-hour from former "Smallville" star Michael Rosenbaum, Sony and Happy Madison. Rosenbaum and Jonathan Silverman are set to star in the project, created by Rosenbaum and based on his personal experiences. It revolves around two friends, former actors on a science fiction show that has since developed a cult following, who have hit rock bottom and must work together to get their lives back on track. Although Syfy's lineup remains 70% drama, the network is serious about adding live-action half-hours in addition to the comedic hourlongs it now has, including the hit "Warehouse 13," Syfy senior vp Andrew Plotkin said. "It helps us counterprogram and bring in younger audiences," he said. Syfy has one half-hour series on the air, the animated "Outer Space Astronauts." Plotkin said the network's brass were instantly drawn to "Zeroes" because of the involvement of Rosenbaum, Silverman and Happy Madison, but it was the concept that sealed the deal. "This is such a personal idea of Michael's stemming from his experience on 'Smallville,' " he said. "There is a lot of character depth to it." Plotkin can relate to Rosenbaum's experience: As an executive at Warner Bros. TV, he was involved in the development of "Smallville." Rosenbaum got the inspiration for the show while attending numerous sci-fi/comic book conventions while on the long-running WB/CW series. He describes "Zeroes" as "Galaxy Quest" meets "Eastbound & Down." "Through drugs and drinking, (the characters played b Rosenbaum and Silverman) didn't save money and, years later, the only thing they have left are the conventions, all they've got are their loyal, devoted fans," Rosenbaum said. "Our show is not about being in the business, it's about being out of the business; it's the 'Non-tourage.' We're the losers you want to see back on top." Adam F. Goldberg is attached to the project, which has received a script order, as executive producer/showrunner. 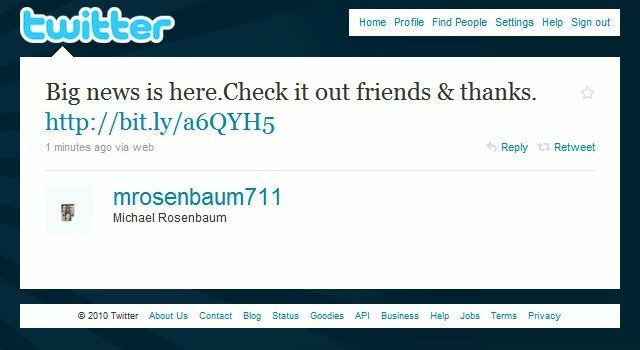 He and Rosenbaum first met for a script Goldberg had in development at Happy Madison for which the company's Doug Robinson thought Rosenbaum would be perfect for. "We started talking about a bunch of nerdy things," said Rosenbaum, a self-professed geek who regularly attended sci-fi and comic conventions as a fan long before he made it as an actor. "Next thing, we were writing a horror movie together." The two are shopping that horror pic to movie studios. Rosenbaum also is guest starring on Goldberg's pilot this season for Fox and Sony/Happy Madison. Rosenbaum, also repped by attorney Todd Rubenstein, next stars in "Father of Invention," while Paradigm-repped Silverman will next be seen in "Swinging With the Finkels." Both are managed by Untitled. OMG, what exciting news!! I'm so happy for Michael!! And the concept sounds hilarious! I can't wait to see it! ETA: Okay, now that I've calmed down a bit, I see that the article says the project "has received a script order." So I guess this isn't a pilot or a series for sure yet? I have faith it will be, though; it's inspired, and perfect for Syfy! ETA2: And Michael himself tweets a link to the article! So happy for him! I'm SOOOO proud of him!!!! This sounds great! God, I'm glad he waited for the "right" thing to come down the pike instead of jumping on the next project just to be doing something. It sounds incredibly amazing and wonderful!! His own show, that he created!! *flails* I was one of those who was hoping he would come back to Smallville, but this is a million gazillion times better than that!! No wonder he was so excited on Twitter the other day!! I think so, too! And gag reels! Awesome, outrageous gag reels! *so excited* YAY for him! dare we hope for a Tommy-cameo at some point? Dare or not, you KNOW I will hope, with every fiber of my being. :) Best case? He plays an evil version of himself, a la Wil Wheaton on TBBT. I would DIE. It sounds so perfect! Oh, the stories he could tell! He could keep us entertained for YEARS. I'm so happy for him. I hope it all works out! I do, too, always. And what a glorious way this would be for him to return to our TV screens! Oh, the fun to be had!! I really hope this happens for him, it would be awesome on so many levels! This sounds like such a fun idea! Here's hoping it makes it to the small screen. And yes, a cameo by Tom would be beyond awesome. Thread started by Sell crazy someplace else, all stocked up here! Rosey back on TV?!?! YAY1!!!!!!!!!!!!!!!! I know!! I hope it all works out!! And I love Jonathan Silverman, too! Bonus! I used to love his show "The Single Guy"
Doesn't it sound like it could be just too funny? I would love to see some genre show actors guest star as themselves, especially, of course, the people from Smallville! YAY!! He must be so excited to be working on this project, I'm so happy for him!